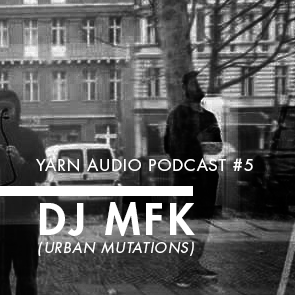 The 5th Yarn Audio podcast is mixed by DJ MFK, aka Koen Nutters; a Dutch, Berlin based DJ and musician who, together with his Urban Mutations crew, runs two monthly nights at »Paloma Bar« and at Neukölln’s favorite bar »O Tannenbaum«. They play an engaging mix of multi-stylistic club music, pushing structural boundaries without losing focus on the dancefloor, and keeping the night as varied as possible. This mix lays its focus on bass heavy Bristol tunes along with some Grime 2.0, some Club Constructions and a little Fade to Mind R&B. Bookheaded by two cuts from one recent and one upcoming PAN release. All with a lot of space and a lot of creative arrangement and tight but organic mixing by MFK. Next to DJ-ing, KN is also part of several experimental music groups such as t-h-e-p-i-t-c-h, Konzert Minimal and The New Silence. Check out their upcoming event at Chesters!